The brain evolved from the bottom up and one of its first structures was the Amygdala. An almond-shaped set of neurons located deep in the brain’s medial temporal lobe. It plays a key role in the processing of emotions and is linked to both fear responses and pleasure. For this reason it is often known as the “emotional brain”. While a lot of research concentrates on the rational brain in the frontal cortex, not much is said about the Amygdala even though it plays a central role in so many current problems, including alcoholism, drug addiction, depression, and anxiety disorders. 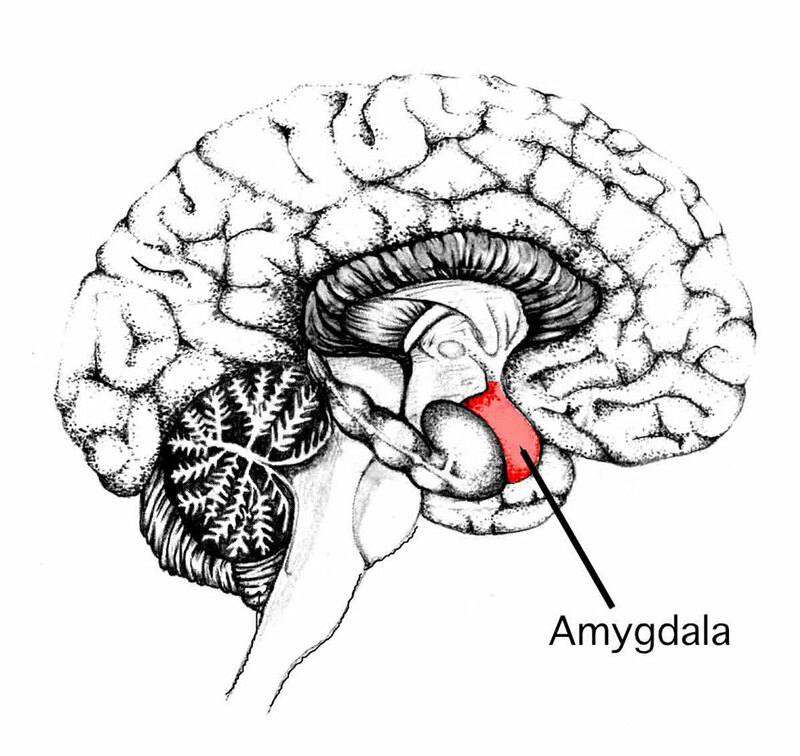 Here is an in-depth look at the Amygdala. The Amygdalae perform the primary roles in the brain of the formation and storage of memories associated with emotional events. The most important of which are the memories that elicit fear behavior. For dangerous situations this behavior can save our life but in today’s modern world it often acts in a role of paralysis, where the central nuclei is the genesis of many fear responses, including freezing (immobility), tachycardia (rapid heartbeat), increased respiration, and stress-hormone release. The Amygdala is also involved in the modulation of memory consolidation. Following any learning event, the long-term memory for the event is not formed instantaneously. Rather, information regarding the event is slowly assimilated into long-term (potentially life-long) storage over time, possibly forming permanent neural pathways. The formation of those permanent pathways, called long-term potentiation, can become vital for behavior. Creating pathways for anxiety, fear conditioning, can be hard to overcome. Whereas, starting with pathways for positive behavior can improve behavior and help during stressful events. This kind of positive conditioning can be done as an adult. A study performed on Buddhist monks who do compassion meditation have shown that they can modulate their Amygdala during their practice. When tested they showed a calmer reaction to stress than other people. The Amygdala is most active when emotional. Greater emotional arousal following an event can enhance a person’s retention of that event. Which makes it interesting because it controls both emotion and memory. The full extent of this “bias” is not fully understood. The obvious studies on fear and anger show positive correlations, where increased fear (emotion) then increase memory of that fear. Not much study has been completed on the opposite, for example, do positive emotions stimulate the Amygdala to create memory as much as negative ones do. In nature there is certainly a desire to learn quickly from bad experiences, but is there a similarly strong desire to learn from positive outcomes? As early as 1888, rhesus monkeys with a lesioned temporal cortex (including the amygdala) were observed to have significant social and emotional deficits. Heinrich Klüver and Paul Bucy later expanded upon this same observation by showing that large lesions to the anterior temporal lobe produced noticeable changes, including overreaction to all objects, hypoemotionality, loss of fear, hypersexuality, and hyperorality, a condition in which inappropriate objects are placed in the mouth. These studies and many more discussed below show that the Amygdala plays a substantial role in mental states, and is related to many psychological disorders. 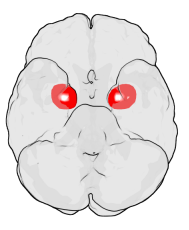 Of particular focus is the left Amygdala and it’s size. Some studies have shown that children with anxiety disorders tend to have a smaller left Amygdala which increased in size with the use of antidepressant medication. The Amygdala exists on both sides of the brain. Other studies found the left side to be linked to social anxiety, obsessive and compulsive disorders, and post traumatic stress, as well as more broadly to separation and general anxiety. Similarly, depressed patients showed exaggerated left side activity when interpreting emotions for all faces, and especially for fearful faces. This hyperactivity was normalized when patients went on antidepressants. Alcoholism and binge drinking also affects the Amygdala by dampening its activation, reducing its ability for emotional processing. This is thought to happen by inhibiting the protein kinase C-epsilon which is important in regulating drug addiction, drinking, and anxiety. “Some emotional reactions and emotional responses can be formed without any conscious, cognitive participation…because the shortcut from thalamus to Amygdala completely bypasses the neocortex (the rational brain)”. In scientific terms, the Thalamus bypasses the Cortex and routes the signal directly to the Amygdala, which is the trigger point for the primitive fight-or-flight response, and in our modern settings can often result in irrational or destructive behavior. “Emotions make us pay attention right now – this is urgent – and give us an immediate action plan without having to think twice. The emotional component evolved very early: Do I eat it, or does it eat me?”. The emotional response “can take over the rest of the brain in a millisecond if threatened” and exhibits three signs: strong emotional reaction, sudden onset, and post-episode realization that the reaction was inappropriate. In these cases self-control is crucial so as to avoid a complementary hijacking. For example ‘one key marital competence is for partners to learn to soothe their own distressed feelings…nothing gets resolved positively when husband or wife is in the midst of an emotional hijacking’. The danger is that ‘when our partner becomes, in effect, our enemy, we are in the grip of an “Amygdala hijack” in which our emotional memory, lodged in the limbic center of our brain, rules our reactions without the benefit of logic or reason…which causes our bodies to go into a “flight or fight” response’. Finding ways to enlarge your Amygdala can have multiple obvious benefits beyond emotional stability. One study “suggests that Amygdalar enlargement in the normal population might be related to creative mental activity”. Another found positive correlations with both the size (the number of contacts a person has) and the complexity (the number of different groups to which a person belongs) of social networks. What was left unsaid was how to increase the size of your Amygdala without the use of antidepressants, or maintain the size after terminating use. One can infer that for those experiencing anxiety or overcome by fear or other emotions, the size of the Amygdala is small. That smaller size leads one to destructive behaviors, flight-or-flight responses, and limited growth. The recommendations by nearly every study may provide an insight into how one can increase the size of there Amygdala. The reoccurring suggestion was practice, or regular repetition that allows the neurons in the brain to form new pathways and then strengthen those until they form the dominant behavior. A method I often practice, although I recommend doing it with a trusted friend or therapist involved. Remember, improvement can always be had and nothing about you is set in stone.